Perfect way to offer protection to your pets whilst also giving them the freedom to access fresh air. Super fast shipping from USA ! Our cages are the easiest method to protect your pets while also giving them the liberty to get admission to fresh air. Our Top of the range, steel galvanised frames are designed to last for years and be offering peace of mind to the welfare of your animals. Also ideal for a fruit Cage to forestall your hard-earned harvest being taken away. 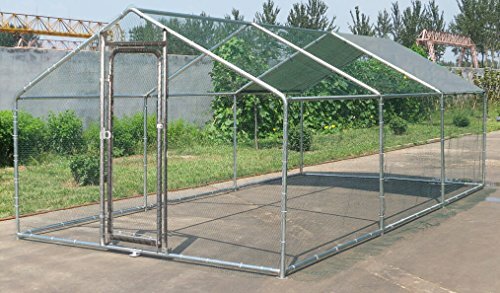 Our walk In poultry pen run out of doors exercise cage is product of 1.5×1.5 inch 38mm galvanized steel tube. Extra large poultry pen supplies a Top of the range area in your poultry to be safely secured in. Featuring a big UV stabilized shade sail that gives essential shade on heat days and a powerful 1×1 inch, 19 gauge thick wire, pvc coated hexagonal wire mesh. • Highest strategy to run and play safely in your pets from dogs, chickens, rabbits and the like. • Top of the range and durable structure if you want to be offering peace of mind and keep predators at bay. • Larger range of sizes to be had in our shop. Highest method to protect your pets while also giving them the liberty to get admission to fresh air.